The wines of Tiago Teles could not find greater contrast than EXPLICIT Red, the subject of my last post. It came as no surprise to me that Teles was influenced by his latest travels to Beaujolais and Burgundy. 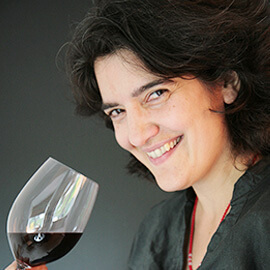 His 2013 red wines, Gilda and Maria da Graça, are as fragrant and feminine as EXPLICIT RED is muscular and masculine. The alcohol levels are poles apart! EXPLICIT 2012 at 15.5%, Maria da Graça 2013 at 11%. For me, one of the most exciting aspects of wine is its diversity of style. With a dizzy-making number of variables related to terroir, grape variety, vintage and winemaking, wine appreciation is an exciting, never-ending journey. In fact, come to think of it, I reckon that Teles’ reds are both firsts for me. I don’t believe I’ve tasted either a Merlot, Tinta Barroca, Tinta Cão blend or a blend of Alfrocheiro and Alicante Bouschet before. However, as Teles pointed out in last year’s interview, grape varieties are less important than origin and, without question both reds, as he puts it, “transmit exactly the limestone and cool profile of Bairrada.” You can almost feel the chill of this coastal region’s northwest Atlantic winds and the damp clay beneath its chalky soils. In London, Teles’ low intervention, “vin de soif” (light, fresh, thirst-quenching, low alcohol) style is currently all the rage in the independent wine bars and stores which have sprung up in my borough of Hackney. Should this style appeal to you, when next in London make a bee-line for the likes of Trangallán, Brawn, Sager & Wilde, Rawduck, Primeur, Verden, Noble Fine Liquor, Bottle Apostle and Borough Wines. Alicante Bouschet famously has deep purple flesh (most red grapes have white flesh). Its pigment stains the leaves of vines and gives tremendous inky depth to wines and yet this blend of Alicante Bouschet and Alfrocheiro is even paler than Gilda! Unoaked, it’s more delicate too, very much in a Beaujolais style with its silky smooth (fish-friendly) tannins, peony floral perfume and juicy, wild fruits of the forest. Delicate and fresh it’s deliciously digestible and weighs in at just 11%. This pale ruby wine is made from exactly the same old vine Baga grapes which go into Pato’s Nossa Calcario. However, unlike Nossa, which is aged in oak (quercus), this wine was aged underground in two 300 litre amphorae. Amphorae first because they are made of clay – the soil of the region (indeed which gives its name to the region). Second because the clay allows for a gentle micro-oxygenation which, together with a hands off approach vis a vis extraction (it simply undergoes a long ferment on skins), accounts for its silkily fine tannins. The fruit is ever so pretty and pure – red cherry, cherry stone and juicy plum and, though delicate, it glows intently, lingering long on the palate. Just lovely – a joyous summer’s day red in handy picnic perfect half bottles at that. 11.5% abv.